So you've ticked off a few marathon-distance trail-running races, and now you want to go even further. Linda Doke shares her first-hand advice on how to do it. So you’ve ticked off a few marathon-distance trail-running races, and now you want to go even further. 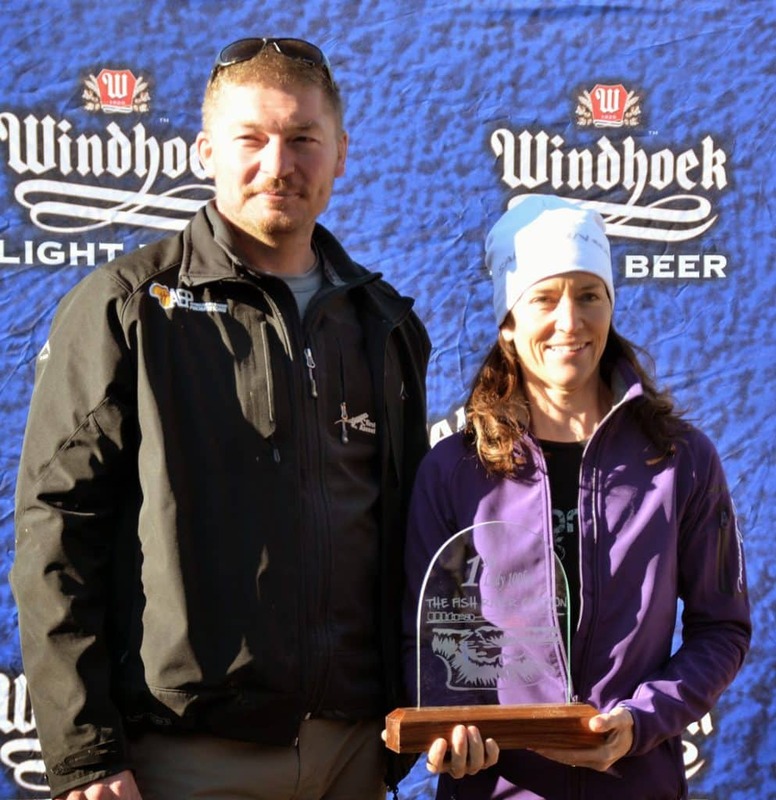 Linda Doke, the Windhoek Light Fish River Ultra women’s course record-holder and editor of Runner’s World Trail, shares her first-hand advice on how to do it. Ultra-distance trail running is more popular than ever in South Africa. The attraction isn’t just the sense of achievement in accomplishing the extraordinary; but also the tremendous inner journey, on which you experience highs and lows, depend on your mental strength to get you to the finish, and discover how far your body can be pushed. Your surroundings are an added bonus, be they an endless desert or snow-capped mountains. 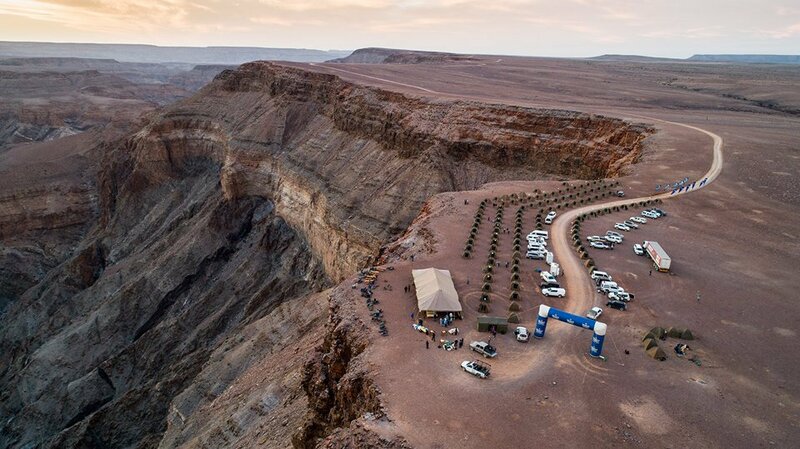 In the case of the Fish River Canyon Ultra, which takes place on 30 June this year, participants run through the second-largest canyon in the world, surpassed only by the Grand Canyon in Colorado, US. There is no description that can do it justice. The rugged, dramatic majesty of it is only exceeded by its enormity. Every time I looked up at the 500m cliffs that towered above me during the race, I felt like a tiny ant, running alongside the river at their feet. The Fish River Canyon is an awe-inspiring place – there’s no doubt about that – but it’s also desolate, harsh and unforgiving. How do you prepare for running 100km, self-supported, through this environment? Start training several months prior to race day. Aim for 16 to 20 hours a week, including gym, core strength and stability work (more about that below). The ideal time to peak is on race day. I did my last long run four weeks prior to the race; after that I tapered, by gradually cutting down the volume of my mileage to 40 – 60% per week, but keeping the intensity. Tapering will minimise your risk of injury, and ensure you arrive at the starting line in the best possible condition. The most important aspect of your training programme is the long run. It’s less about hauling your body out onto training routes for hours on end, and more about carefully planned distance runs. Aim for at least three a week; two of which you should do back-to-back, because it will teach your body to run on tired legs. Add tempo runs, speed work, interval training and hill repeats, to improve your strength and stamina. Recovery is as essential a part of training as hill repeats and speed work; and yet, it’s often the most ignored. Arriving at the start of the race feeling overcooked is the last thing you want. The early warning signs you’re overdoing it are: sluggishness; loss of willpower when it comes to heading out for your next run; falling asleep at your desk at work; and cold and flu symptoms. There’s more benefit to be had from taking a break than there is in forcing yourself to run. A sports physio will understand your need to resume training, and will be able to give you honest advice. Heed that advice. Many runners simply translate the advice they’ve been given into what they want to hear; and that can only doom your training. Never try to make up training you’ve missed, because you’re either newly healed, or healing well, and the likelihood of re-injuring yourself will be high. If you’ve been laid off for up to two weeks, pick up from where you would be in your programme but scale it down a little, because you will have lost some fitness. There is lots of loose shale on the descent into the Canyon, and you’ll often cross pebble beds in the shallow river. Once you’re in the Canyon, there’s not much in the way of technical terrain; but there is loose, deep sand – and lots of it! Not everyone has the luxury of being able to train on the beach, and that’s fine. Back-to-back long runs will help, and strength training will ensure leg stability and endurance. Temperatures soar in the Canyon. It’s not possible to train in hot conditions if you live in South Africa, because the race takes place during our winter time. Alternatively, plan a good heat-management strategy for race day, and execute it accordingly: drink often, and whenever you find water, use it to wet your head, ears, wrists and the back of your neck. A warning: there’s not a lot of flowing water in the Canyon. By the time the river reaches the Canyon, a lot of it has travelled underground, often resulting in stagnant pools, which aren’t safe to drink from. A rule of thumb: only drink from water that is flowing. Visualisation is the best way to prepare your mind for what to expect on race day. I had never been to the Canyon before I ran the Ultra. I did as much research as I could, and spoke to people who had done the race before. That way, I knew to expect a little water and a lot of heat. If your core isn’t strong, you’ll slouch during the latter stages of the race, when you’re at your most fatigued. This will make running feel harder, and increase your chance of injury. It’s up to the individual to navigate their own way through the course, which consists of various trails and short cuts. Opt for a hand-held GPS device as opposed to a watch, as they have a longer battery life. Practise using it on one of your training routes at home; familiarise yourself with the readings it gives you – and purposefully deviate from the route, so that you learn how to set yourself right again. The device won’t work when you’re stationary. If you get lost, take 10 strides in any direction, and your GPS will find you again. During your long runs, practise how you’re going to carry and pack your food. For example, I stash mine in tiny ziplock bags. What to eat during the race depends on the individual. There are runners who can survive 100km on gels alone; whereas I know, from past experience, that gels upset my stomach within the first hour. 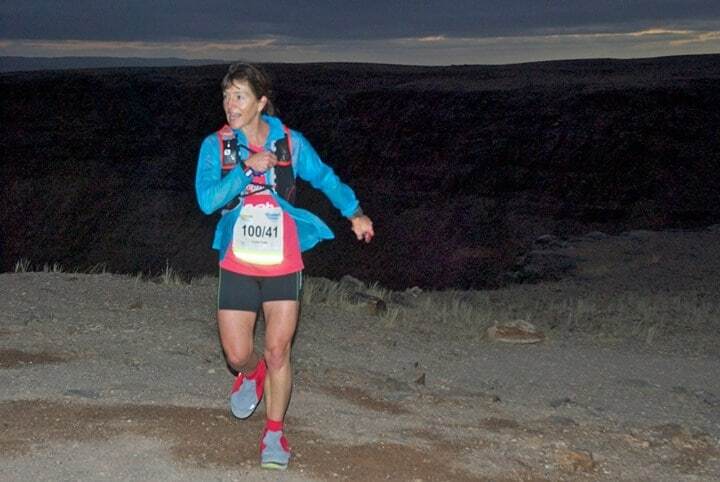 During a hot race like the Fish River Canyon Ultra I’m more a fan of eating real food such as salted nuts, to replace the sodium I lose when I sweat. Nibbling small amounts, often, will prevent your blood-sugar levels from dropping. UV sleeves will protect your arms from the sun. Keep splashing them with water. They won’t stay wet, of course, because you won’t find water often; but they will conduct heat away from your body, which is exactly what you need to keep you cool. Wearing gaiters on your shoes will keep the sand out. 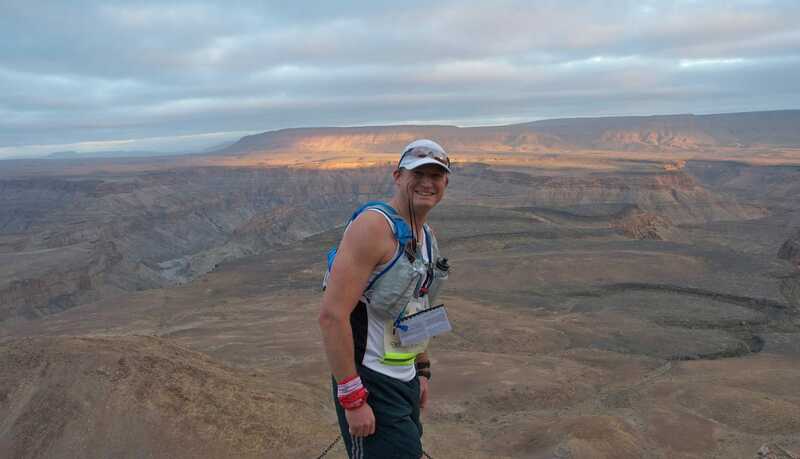 The Fish River Canyon Ultra starts in the dark, at around 4am, when the day is at its coolest; and the initial 10km is run on a winding dirt road, with no radical ascents or descents. But feeling great isn’t a licence to push harder; because in any ultra, there are lows as well as highs. Continue to eat well, hydrate and maintain a steady pace. You have a whole day ahead of you, and it’s not worth blowing it all in the first 10km! When the lows come – and they will – your mind will try to dissuade you from carrying on. Slow down, cool down, and eat something to increase your blood-sugar levels. Walk, power hike, or sit down if you have to. Pick up the pace only when you’ve gathered yourself together. Always be adaptable when it comes to nutrition, pace management and heat. For example, if you get lost, re-trace your steps back to the last point at which you knew you were on the right route. The Fish River is the second largest canyon in the world, surpassed only by the Grand Canyon in Colorado, USA. 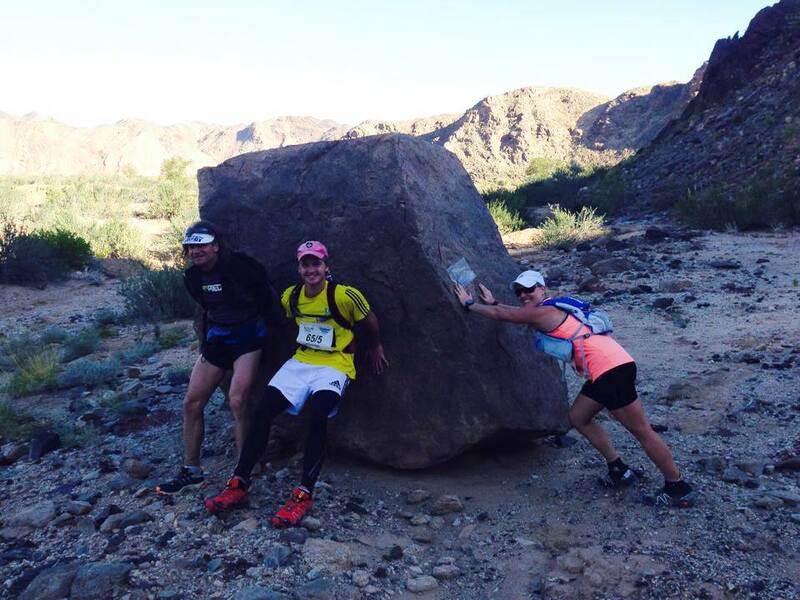 The Windhoek Light Fish River Ultra offers two routes, 65 km and 100 km. Both routes are unsupported (except for water) and competitors are expected to finish it within 24 hours.